For the first time in playoffs history, two teams who faced each other in the last game before the playoffs – Olympiacos Piraeus and Zalgiris Kaunas – go right back at it with a five-game series to decide which of them proceeds to the 2018 Turkish Airlines EuroLeague Final Four in Belgrade! Although there is one other series this season featuring a playoffs newcomer, nowhere is there such a clear and almost complete disparity in post-season EuroLeague experience as between Olympiacos and Zalgiris. Start from the fact that since the current playoffs system began in 2005, Olympiacos has played in 11 series totaling more games, 43, than any other club. For Zalgiris, those numbers are zero and zero. Over the last six years, we have seen Vassilis Spanoulis, Georgios Printezis & Co. win two EuroLeague titles, in 2012 and 2013, and play in two more championship games, in 2015 and 2017. Spanoulis has played in eight playoff series in his career and is ranked fourth in competition history with 34 playoff games played. With 456 points in playoff games, Spanoulis is second to only Juan Carlos Navarro (534) in scoring, and has accumulated the second-highest index rating (448), again behind Navarro (517). But in assists, Spanoulis is first with 168. Several of his teammates – including Printezis, Kostas Papanikolaou, Vangelis Mantzaris and Ioannis Papapetrou – count their playoff games in double-digits, as well. While on the other hand... Zalgiris has one player with playoff experience since 2005, guard Vasilije Micic, who was on Crvena Zvezda mts Belgrade when it got swept by CSKA Moscow in 2016. That's it. No other Zalgiris player has a single game of EuroLeague playoff appearance. Paulius Jankunas has played in 291 EuroLeague games, the fourth-most ever, without setting foot in the playoffs, and Arturas Milaknis will finally do so in his 142nd game. Which is not to say Zalgiris has no winning experience at this level. Jasikevicius, of course, is the only player ever to win four continental titles with three different clubs. And mid-season addition Beno Udrih won the NBA title twice with San Antonio last decade. Olympiacos is traditionally known as a clutch team, with series of memorable late-game heroics from Spanoulis and Printezis. This season, however, Zalgiris has played 12 games decided by 6 points or fewer – and won 10 of them. And that includes two such games against Olympiacos! The score between them was 74-68 in Round 15 in Kaunas as Zalgiris, trailing by 5 points after three quarters, went on a 17-5 surge to start the fourth and held on down the stretch. The Zalgiris starters outscored those of Olympiacos by 53-41 that night and also won in assists, 14 to 10. 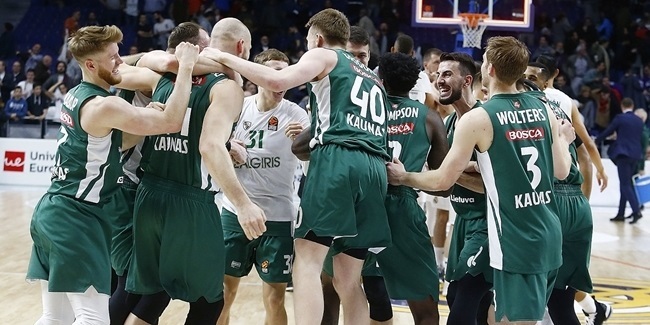 The Round 30 rematch in Piraeus saw Zalgiris turn around a double-digit difference at halftime to send the game to overtime and win it 85-86 on a late tip-in by Jankunas. 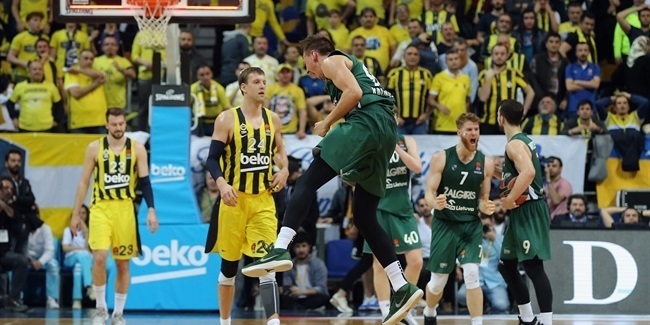 That game did not mean anything for Zalgiris's final position in the standings – except that it was likely to guarantee playing Olympiacos again in the playoffs. So the underdog in this series has swept the favorite, fair and square, in the regular season, but it should be noted that Printezis did not play in either of those games, and he is the leader in rebounds (4.1 per game), co-leader in average PIR (14.8) and second-best scorer (12.6 ppg.) for Olympiacos this season. Not to mention that Printezis hit the biggest clutch shot this decade in the EuroLeague. Olympiacos has had home-court advantage in five previous series and won four of them with an overall 13-7 record. The Reds defeated Real Madrid in the 2009 playoffs to reach the Final Four for the first time this century. The also beat Asseco Prokom in 2010, and Anadolu Efes Istanbul in both 2013 and 2017. The only series that Olympiacos lost despite home-court advantage, to Montepaschi Siena in 2011, was a unique one. The Reds took Game 1 of that series by a record margin of 48 points, 89-41, which was also the best defense ever played in a playoffs game. Surprisingly, Siena won the next three games and reached the Final Four. The next season, however, Olympiacos turned the tables, beating Siena without home-court advantage and continuing all the way to the 2012 title, the start of its remarkable span of two trophies and two more runner-up finishes in the last six years. Along the way, Olympiacos has won 11 of the last 12 playoff games on its home floor. The streak had been 10 in a row until Efes won in Piraeus in Game 2 last season. It comes as no surprise that Olympiacos has used defense like no other team to win playoff games during that remarkable run. In a 14-game span since the 2011 playoffs, the Reds have allowed fewer points per game (66.7) at home than any other team. They also have held opponents to the second-lowest two-point shooting (45.5%), and three-point shooting (28.6%.) among playoff teams in that span. All of those numbers improve upon what Olympiacos did in all of its home games during that span, allowing 71.2 points, 46.6% on two-pointers and 33.8% on threes. It's more evidence that the Reds and their fans know how to step it up together when playoff time arrives. As mentioned, Zalgiris will rely on the playoffs experience of Sarunas Jasikevicius – just not his experience as a head coach in this phase. In fact, he and Pedro Martinez of Kirolbet Baskonia Vitoria Gasteiz are the only two coaches making their EuroLeague Playoffs debuts this season. But when it comes to knowing and succeeding in the playoffs, Saras takes a back seat to no one. Jasikevicius won EuroLeague four titles, the second-highest total of any player the Final Four era that began in 1988, but two of those – with FC Barcelona in 2003 and Maccabi Tel Aviv in 2004 – happened before the playoffs system was in place. The next year, in 2005, he and Maccabi romped through the new best-of three playoffs to win the title again. The next time he was in the playoffs, in 2009, the format was expanded to best-of-five series, and again Jasikevicius made it through and won the title, this time with Panathinaikos Athens. He subsequently played playoffs again with Panathinaikos in 2012, surviving a five-game classic against his old team, Maccabi. And he played his fourth series the next year, back in Barcelona, winning another five-gamer, this time against Panathinaikos! All told, Jasikevicius as a player had a 11-7 record as a player in his four playoffs series, but the most important fact is that he was undefeated in them. 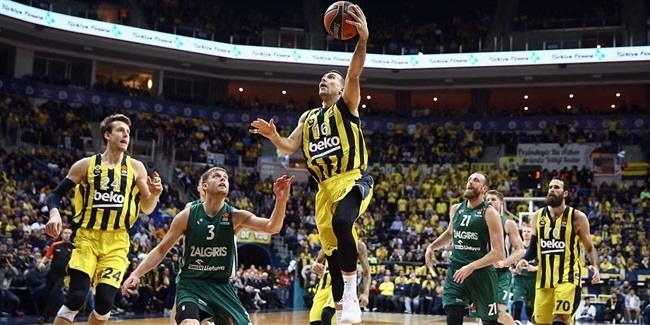 Every time the playoffs finished, the great Saras was on his way to the Final Four.